The county seat of Jefferson County in the central section of the state of Colorado, Golden is a home rule municipality located at the Front Range of the Rocky Mountains. The city was the capital of the Territory of Jefferson for one year in 1860 and was made capital of the Territory of Colorado for a five year period from 1862 to 1867. It covers an area of 10.06 square miles and has an estimated population of around 20,000 people. Golden was founded as a mining town in June of 1859 during the Pike's Peak Gold Rush. It wasn't named due to the presence of gold nearby, but was instead called 'Golden City' to honor Thomas L. Golden, a miner. Golden City swiftly became a popular mining and trade hub. Various notable prospectors arrived in the area and the town thrived for many years. However, the establishment and development of other major cities like Denver led to the decline of Golden. The city eventually managed to rebuild itself and saw a big surge in popularity in the wake of World War II with the building of various stores and museums, as well as a theme park nearby. 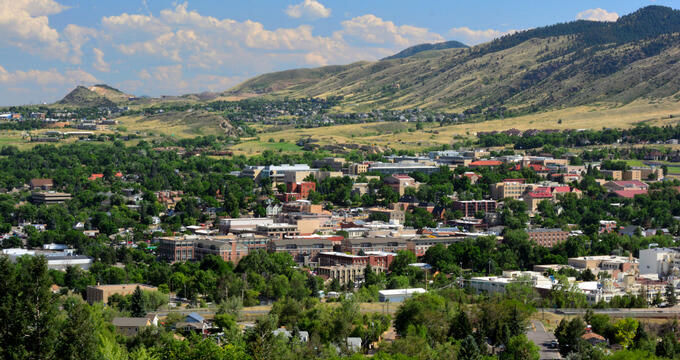 In the modern era, Golden is still a relatively small town but has a lot to offer, from its beautiful scenic views in every direction to its thriving microbreweries and attractions like the Colorado Railroad Museum and Colorado School of Mines. The elevation of a town or city is the geographical term used to denote how high or low that area is in relation to the mean sea level of Earth. Many major locations around the United States and the rest of the world are built at quite low elevations of 500 feet (152 m) or less due to their coastal locations, but the town of Golden in Colorado has a very high elevation, several thousand feet higher than many other American towns and cities. Golden’s elevation is 5,675 feet (1,730 m), which is common for many towns in the Front Range area. The state of Colorado is very high in general, with a mean elevation of 6,800 feet (2,070 m) which technically makes it the state with the highest average elevation of all. This is mostly due to the Rocky Mountains and other high areas found around the state. The highest city in the entire United States is also found in Colorado; the town of Leadville, an old mining town situated right among the Rocky Mountains, has an elevation of 10,152 feet (3,094 m). The highest point in the state of Colorado is Mount Elbert, which is the highest peak in the Rockies and has an elevation of 14,440 feet (4,401.2 m), while the lowest point in the state is the Arikaree River near the Kansas border, which has an elevation of 3,317 feet (1,011 m). Big cities around Colorado include the state capital of Denver, which has an elevation of 5,280 feet (1,609 m) and is nicknamed the ‘Mile High City’, as well as Aurora, which has an elevation of 5,472 feet (1,668 m) and Colorado Springs, which has an elevation of 6,033 feet (1,839 m). The elevation of Golden, CO actually has a direct effect on its climate. Cities located at higher elevations tend to have colder weather in general, as temperatures drop as altitude rises, and higher chances of snow. The city of Golden receives over 65 inches of snow per year, and there's a large chance of snowfall throughout much of the year from fall through to early spring. When the temperatures are slightly higher, Golden also receives around 19 inches of rain each year. Temperatures can drop down to average lows of around 18°F (-8°C) in January and get as high as 86°F (30°C) in July. Golden isn't regarded as a popular tourist spot, but there's plenty to do in this little city. Golden has a lot of history behind it and is proud of its status as a once-prosperous mining town, evidenced by the Colorado School of Mines located in the city itself. The Colorado Railroad Museum is another popular attraction, along with the Golden History Center and Bradford Washburn American Mountaineering Museum. The city hosts several annual events and is a popular spot for climbing, mountaineering, hiking, and more in the surrounding areas. For something more relaxing, the city is home to several microbreweries and runs beer festivals each year.